Since Vince is getting bigger he is ready to start practicing sitting up. I had this bumbo seat on my baby registry but didn’t end up receiving it. So i took Vinny to Babies R Us and had him try it out at the store to see if he’d like it and it seemed like he did so i went ahead and bought it. He was all smiles when we put him in it at home. Daddy had to help him sit up right though. 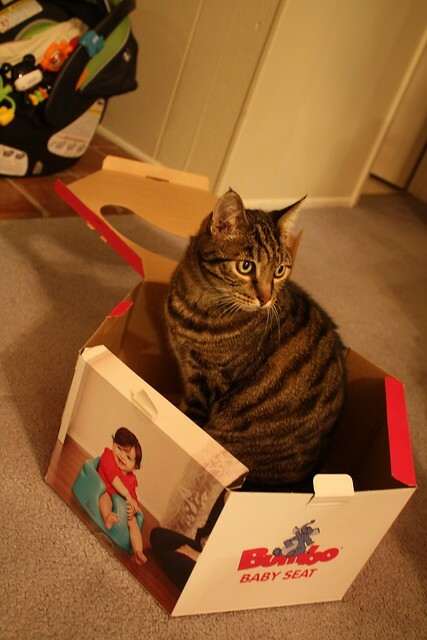 You-know-who wanted to play with the box!